Today I am back from Oklahoma. The temperature when I arrived was in the 60's, and I luxuriated in the coolness of the evening. I guess I just don't thrive on hot climate, and Oklahoma was warm all the time, even with the air conditioners in my mom's house going full throttle. Anyway, I had a good time, and I'm happy to be home again. Michael leaves today to San Diego for a "summit" about Everquest at Sony headquarters. He is meeting with other power gamers, to discuss the new expansions. Sounds like fun, and I'm glad it's him and not me. They wouldn't invite me there, that's for sure. I miss my gaming time, and look forward to being online this weekend. George leaves on Sunday for another business trip to Hawaii. In order to save thousands, he is flying at 6 a.m. on Sunday. He flies first class, doctors orders, because of his back and the fact that he is so tall, the seats are just plain uncomfortable. I can vouch for that. I fly coach, and yesterday I had barely room for my relatively small purse, a small bag with a paperback, a bottle of water, and a Harpers Bazaar magazine. I was scrunched in there like an old kleenex. Wonder of wonders, my connection through Chicago went swimmingly. I had to walk fast through 38 gates, but that was ok--good and much needed exercise. There was a thunderstorm right overhead, and we still took off right on time and were in the air in a flash--literally. The flight seemed short. I read a novel, Blackwood Manor by Anne Rice, and haven't got to the vampire part yet and I'm almost through. It is good, and my first Ann Rice book. She has legions of fans and writes about New Orleans and the South, and I'm enjoying the book. I'm still really sad about all that has happened in the Gulf Coast. It seems like a wound that will take an awfully long time to heal. Back to work. Have a great day ya'll. I couldn't resist writing a few words about my 40th reunion this weekend. The dinner at the Elks Club in El Reno was last night and it was great fun. I can't get over the fact that everyone showed up both nights early...no waiting around to be the last to arrive or to make an entrance. Everyone came from far and wide to be there and by golly they came to have a good time. We found ourselves standing around staring at each other waiting for recognition to dawn, and then we smiled and laughed and hugged. It was really great to see so many of us there. My take on the whole thing is that we are one big happy successul fun bunch of people. Most talked about their grandkids and their adventures in life, and most have had successful careers and lives. I didn't meet anyone at all that wasn't happy to be there and friendly as "all get out". The fact that neither evening was air-conditioned was a real "ice breaker" since we all tended to try to find a cool breeze and gathered in small groups to fan each other and talk about how hot we were. Even with sweat running down our backs, we smiled through it and enjoyed a great Elks home cooked meal and a rich dessert that looked like heart-attack-on-a-plate to me. It was chocolate pecan pie as far as I could make out and I ate way too much of it. So many of my classmates are better looking than we have ever been, and no one seemed to wish that they looked like the picture on their nametag. We were all comfortable in our own skins, even if that skin is a little more road weary. It was a great time. The music started and after a few loud 60's songs, I'd had enough and moved to the cooler climes outside. I had a great conversation with two classmates and friend about riding Harleys and how much fun we have had in our lives doing unexpected things. It will take a long time for me to process all that I learned, and I hope folks will look me up and email any time. What an awesome bunch of people. More later. Have a great Sunday. I'm at my mothers house in Oklahoma working on a borrowed laptop. Takes some getting used to and I'm not sure about this keyboard. I feel like I'm typing on a gameboy. The weather is coolish and sunny for now, and the afternoon heat will start warming us up soon. I am going to the first part of my highschool reunion this evening--a meeting up at the local hamburger stand across from the highschool. I'm also keeping up with my Ebaying, and doing what I can around here to make things a little better--like doing dishes, running errands, etc. I think this will be my last blog entry until next Thursday, so have a great week. We are all glued to CNN to see how Hurrican Rita will turn out...and praying for all concerned. Well, it is time again for me to put that suitcase on the bed and start throwing things at it. I am a terrible packer. It is hard for me to admit that. I take too much. I often have to unpack the whole suitcase at least once to make sure that what I put in the suitcase first is something I still want to take. The world has become a strange place. I take a lot of electronics when I travel: my phone, my charger, my IPOD, my charger, my GameBoy Advance, my charger. Then the jewelry goes in. I travel with jewelry the way a child travels with a teddy bear, it is my Comfort and Joy. By jewelry, I don't mean diamonds and pearls, I know enough to leave the good stuff at home (if I have any), but the jewelry pieces I make myself; things that become like children. Then I start packing clothes. I always bring too many clothes to every location. Usually I come home with at least three things I never even took out of the suitcase. When I get there, I am just like I am at home, and put whatever on, and just go. But packing for a trip, I imagine every possible scenario, and pack accordingly--hence, too much stuff. Shoes are a problem. I have lots of nice shoes, and especially like to take my Birkenstocks. I can't live without Birkenstocks. Any good knitter worth her socks wears Birkenstocks! They are heavy, clunky and don't pack well, but in they go. This trip is my High School Reunion. We won't even BEGIN to talk about the pressure that puts on a person when it comes to the right outfit. I've now decided to ignore that whole problem, and just "go are you are"...sort of like a pajama party. I will just wear what happens to come out of the suitcase first. I'm sure there will be a LOT to choose from. Yesterday was George's remote controlled flying club picnic. Their field is near the salt marsh, not far from the city of Boston, and you can see for miles around from their vantage point. The skyscape of Boston is in the distance. It is a really pretty place to be, and they have it gated, so it is a private place, and very serene. The salt marsh is huge there and you can see for miles and miles. He met a friend there, and spent the whole day visiting, flying his new plane, and eating hamburgers. I dropped by at lunch time and had a delicious hamburger, and stayed for a short while, and then it was back to my jewelry bench at home. Since I moved to Boston, I have always thought that we are lucky here to have the salt marshes, which attract lots of birds and wildlife, and which provide wide open spaces where no people or buildings can invade. When the tide comes in, they turn into lakes, and when the tide is out, they are mud flats, grass, and reeds. 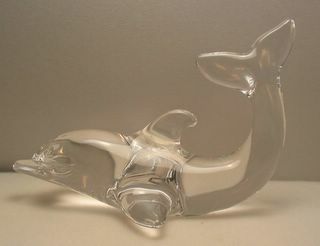 They are always perfect for sea birds of all kinds. I imagine those muddy little clams are in there too, but I have never wanted to dig for them. What a messy business that is! Before I moved to Boston, I thought that there was beach and there was ocean, but I never invisioned the large green or blue spaces of the salt marsh. It is one of my very favorite views and places to visit. When you drive by the salt marsh, you can smell the ocean miles before you reach the shore. Any salt marsh is a peaceful place indeed. My weekend was spent packing for my trip to Oklahoma, and checking on my Ebay listings, and making chandelier earrings. Each earring takes about 1 hour to make, and then...the hard part comes when you have to match the other earring exactly. I have a new technique for making invisible head pins, by turning the wire, and pinching it with my pliers until it just right to fit the inside of the bead. I may not have invented this technique, but it is perfect when it works. Always it takes several tries to get it just right. A dollop of super glue makes sure that the bead stays there forever. All that takes a lot of time. I worked for three hours on one pair of earrings yesterday afternoon. They are made with jade, crystal and jasper and are really pretty if I say so myself. Maybe I'll keep 'em. Search BHV on eBay to find our talented artists auctions!!! 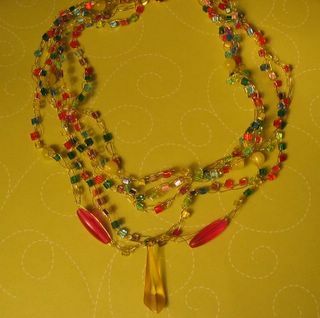 I have joined a group of beaders and jewelry makers on Ebay. It is fun to see all the creative things they make, and to watch the discussion boards. This weekend was all about jewelry and listing 20 items on Ebay. Next weekend I am going to attend my 40th Highschool Reunion in El Reno, Oklahoma. I am going to spend a week with my mother and I decided it seemed like a good idea not to go to Oklahoma and miss my reunion by a week. I don't remember a lot of people who I went to highschool with, but seeing their faces and hearing their stories will probably help bring some memories back. I don't think I had a very good time in highschool, and I was eager to leave Oklahoma and get out into the big world. I wish I had been more outside of myself in highschool I would have liked to get to know more people, make more friends, have more fun times to talk about. In highschool, we are so young, that we aren't "formed" yet into the people we are meant to be. I was judging myself by a faulty yardstick back then. My ruler for success had something to do with the person next to me, and my efforts went into measuring up to others standards--not my own. Now I know that is it not how we look that is important, but how we feel. I feel great. Looking back, I have a lot of fun memories and I guess I had fun. It is just that I have so much more fun now. It was exciting to be a girl then, and have dates with boys, and go to football games and sing in the school choir and have a crush on a young teacher. It was fun to do well at the courses that I liked, and it was awful to try to get a passing grade in Chemistry or Algebra, which I hated. I never think of those years in the mid-sixties without thinking about my dear sweet quiet father, who waited on the porch in his lawnchair for the "boy" to come and pick me up for a date. He must have scared the wits out of them...just sitting there, not saying much. He wasn't trying to. He was just sitting in the chair where he liked to spend the evenings after supper. But, running that gamut to get to me, and then meeting my mother, who is very outgoing, must have been a bit daunting. I never dated a boy who couldn't take that heat, and more, and stand up to it. I am still friends with one of them, and that is a great thing to be able to say after 40 years! I have a new dress to wear to the reunion, and I am going to make myself a couple of "knock your socks off" necklaces. I bought a CD of Sam Cooke, to remind me of those good ol' days, and I'm ready to dance if someone asks me. It will be fun to meet those nice folks again, and if I don't remember them from the first time around, who really cares? 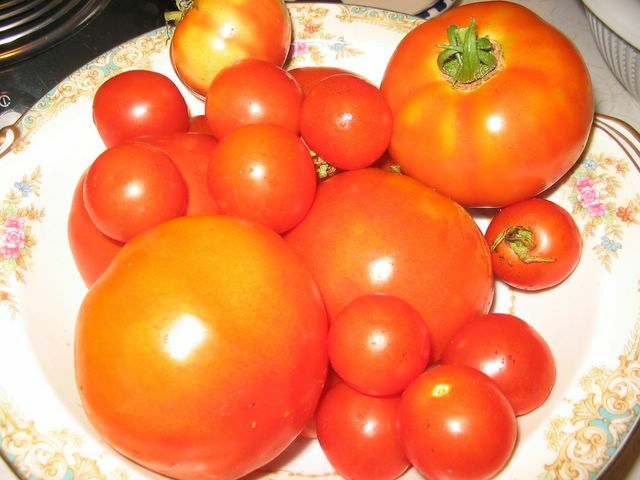 We have a bumper crop of tomatoes this year and pick seven or eight of these beauties every morning. They taste so much better than the tomatoes from the store. And I hate to pay such high prices for store tomatoes that don't taste that good in the first place. Of course, now we don't know what to do with them all. Share them with co-workers, eat them for lunch, put them on sandwiches and if all else fails, make them into fresh tomato sauce for pasta. My favorite is to saute them lightly with green onions, olive oil, red pepper flakes and salt and pepper, and just put them fresh right on the spaghetti. I call it 'summer spaghetti'. This year we managed to fight off our friend Chuckie the Woodchuck, who lives under our garage, to get at our tomatoes before he did. The plants are huge and heavy and not that well organized, but they are really prolific. Must be that good compost we put into the soil in the spring. Off to work with my bag of give-away tomatoes. It was a busy weekend for me and for poor George, my trusty sidekick. We had a table at the Medford Arts Fair on Saturday. It was an all day event, sponsored by Medford Open Studios, and it was a big hit! The weather could not have been nicer. It was 76 degrees and sunny. Occasionally a gust would come through and threaten to tip the whole tent and table over, but that never happened, and it kept things exciting. I met a lot of really terrific people and had a whole lot of fun sharing my jewelry with everyone. 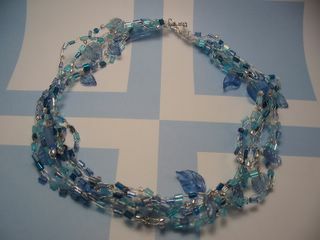 Many people bought necklaces and earrings and my inventory is quite depleted. But I have lots of new ideas and can't wait to get started making some new things. I am in the market for real jade, since one lady would like more earrings in that stone, and I will work on that tomorrow. It would be fun to make a necklace with peridot and jade I think, colors that seem to collide in a very striking way. One little problem that I am having, and which is bothering me, is that my Ebay feedback is not working. I have only received one comment out of all the things I have sold. Ebay left a system wide message that they were having trouble with feedback for some sellers, and I guess I am one. Today on my way to work, I realized that not hearing feedback from buyers is a little like giving someone a present and never hearing a word from them. It just leaves a little "hole" of doubt, whether they liked the item or not. So, I'm suffering a little with that problem, and have sent an email off to customer support to see if they can help. 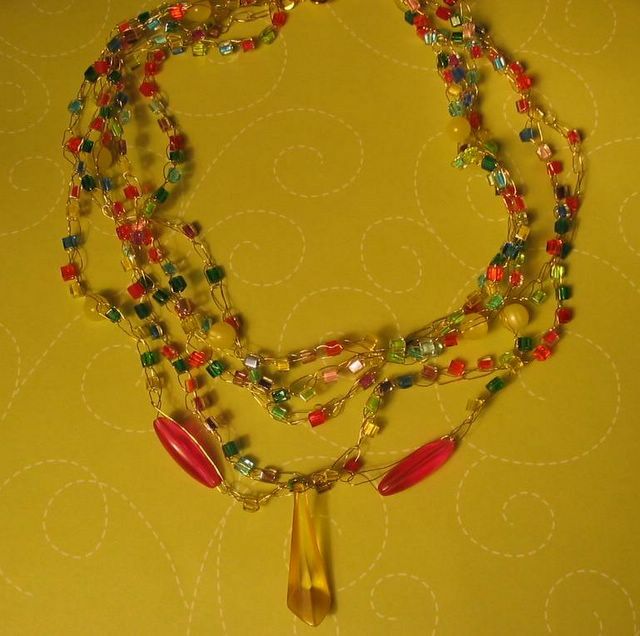 I found a new setting on the digital camera that seems to show the jewelry better in my "photo studio" on the dining room table, so I relisted a few things this morning bright and early. Today is Monday and a long day for me at work, so I have to put my jewelry hat aside and wear my work-a-day public relations hat today. Today I went outside to water the coleus under the tree in the backyard, and turned around and my socks were knocked off by the beautiful morning glory which has finally decided to bloom. 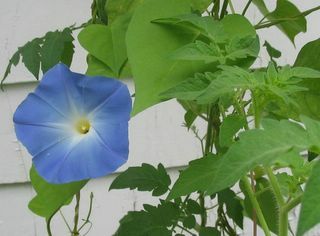 We planted the morning glories behind the tomato plants, and George ran a string up to the gutter. Nothing fancy. The morning glory grew and grew and became very lush right over the gutter, way up high, and lo...today there are many beautiful blooms. 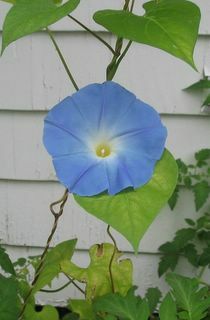 I really can't get over the color of blue morning glories. It is just something out of this world. Have a great morning glory of a day. I got home last night at 9:00 after a long day and an evening jewelry class in chandelier earrings. I was a bit tired, but George won the tired contest. He played a very-unusual-for-him 18 holes of golf yesterday at the company golf tournament. He seemed to play very well, and enjoyed himself, but he came home talking about how good the Gatorade tasted. There was a banquet lunch and he said he had a "lot" of lunch, and he was happy to go to bed last night. A day like that can take a lot out of you, folks. I had a delicious Korean dinner with my friend Dave, and we laughed about how different the food was then what we thought we had ordered. I had a nice place of deep fried meat, that looked like pork, and he had a bowl of very red broth with ribs and transparent noodles. They served all the little white dishes of Korean sides like sea weed and pickles and kim chee. Neither of us expected quite what was served to us, but we had fun talking about it as we munched away. Korean food can be hot, and of course, we looked at the little pepper by our selections on the menu and ordered them anyway. Bring on the Tums. It was fun, we really enjoyed talking about New Orleans and our trips there, and it made me nostalgic enough that I listened to BB King and Eric Clapton all the way home. Today is Organize for Art Fair day around here. I made some new earrings that I will NOT sell, but will wear myself. With over 6 feet of silver wire in this particular pair of chandeliers, I think I will never be able to sell them for what they are worth. Six feet! Can you believe it? George is off playing in a golf tournament today. God Bless Him. We will root root root for the home team, since he hasn't played golf but once before in about ten years. Last time, he went with co-workers, and got low score--and was on cloud nine for about a week. Today, I fear, his beginner's luck may be over, but he decided to go anyway and have fun. There is a pile of golf balls in front of the garage door, I assume they are there because he was "rooting" around for his rusty clubs at 6 a.m. this morning. Well, if not rusty, at least not pristine. He left at "O dark hundred" as he would say and I was tucked away in my beddie. Today however, is a long one for me. My social life tonight includes dinner with a co-worker, and then a class at the Sparks studio in chandelier earrings. Although I have made them before, I feel like there is still more to learn, and this is a teacher who I have never met before. I go armed with my little leather case, my envelopes of silver wire, ear loops, and briolette crystals. We shall see if I can create some new earrings in time for the art fair on Saturday in Medford. I signed up today for another craft show at a church on October 22. I'm hoping to find a few more fans there. Somewhere, there must be people who like sparkly earrings as much as I do! So, I'm at work, waiting for the bell to ring, so that I can recess to dinner at Koreana, my favorite Korean restaurnt, and then on to a fun evening. I can tell that fall has arrived when things start to get really busy at church. Sunday is Rally Day, and I volunteered to be a Sunday School teacher for December and January to the middle grades. I am looking forward to it. In order to get enough volunteers, they tried splitting the year into months and signing people up for a month at a time, since many people were not willing to teach for a full year. I sort of understand that, since it seems like such a big committment, and it is so important to be there every Sunday. I'm looking forward to being a Sunday school teacher and I'm sure the kids will have a lot to teach me. I'm hoping to have some special things for the kids to do, and in some way tie making things and crafts in with the Bible lessons. It seems to me that creativity is really important, and that it would be a fun way to illustrate a Bible lesson. George and I are hospitality hosts at church next Sunday and I will make my favorite Lemon Grove Bundt cake and we are going to buy a decorated sheet cake for Rally Day. George will make oatmeal apricot cookies too, since people really love his cookies. The volunteer lists keep growing at church at this time of year, and I have put my name on several lists. One idea I had last weekend, was to make a Thanksgiving Dinner at church that the whole community would be invited to. This would take place the weekend before Thanksgiving, and we would serve a turkey dinner with all the trimmings. Church members would be asked to donate $ for their dinner, and also bring a dessert, and all donations will go to Lutheran Disaster Relief to aid Hurrican Katrina survivors. I envision a really good turkey dinner and a big buffet of sweets and desserts to share. Others in the community could donate if they want, or they can come and enjoy a free and bounteous early Thanksgiving dinner. Others at church who I spoke too seemed very enthusiastic, so I'm going to work on making that happen. Sounds like something I can do to help others. Fall is a time for ideas, for getting geared back up for school, church, and even upcoming holidays. George and I will be going to visit Michael for Thanksgiving, and are going to have to save some extra money to pay for the gas at these high prices. But that won't stop us. The necklace I finished tonight. Five strands of crocheted beads on silver wire. They are fun to make and keep me out of trouble. A photo I took in my portable photo studio, to see what the grey tones look like. Actually, I kind of like this picture! With all the news that I am reading about the disaster on the Gulf, I have drowned my sorrows in beads. I have made 7 bracelets, 4 pair of earrings, and two necklaces in the last two days. This is my latest one that I finished tonight. I am hoping that others will like them as much as I do. Maybe when I am rich from selling jewelry, I can donate it all to the Red Cross. I really love making them and they are pretty, each one. I'm starting to realize I think of them as "children". That is what artists have to worry about--when to stop working on something and let it go. It is good for me to work on something sparkly and full of light, when we are all so worried about the survivors of Hurrican Katrina and what we can do. Tomorrow is my short day at work, and I will visit the bead store on my way home and then I plan on making a few more items to sell at the Medford Art Fair on Saturday. Such is my life. One thing I do not want my blogger audience to see is the state of my dining room when I am making jewelry. It is quite the factory in there, and I have things just the way I want them--but to the outside viewer it might look a little like tornado alley. I bought some silver fire fly charms which have taken flight in a lot of my earrings and bracelets that I made yesterday, and I have made some pink pearl and Swarvowski bracelets for mothers and daughters that I think people might really like. I will take them to the art fair next Saturday and see if I am right. 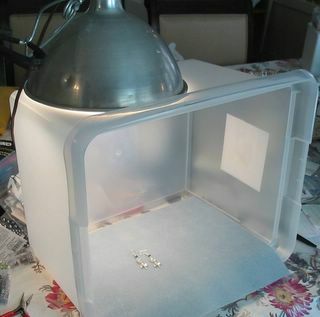 This long weekend has been just right for making jewelry and trying out my new photo studio, which is a translucent white plastic box, turned on its side, with a photo light shining through from above. Although my pictures still have a little too much grey in them, at least they are not all coming out yellow like before. Little by little I am learning how to do this. I read this little hint on a google search about photographing jewelry. Google knows everything. While I have been busy making jewelry, George has been working on his four remote control airplanes, and is either in the basement in his workshop, or out at the flying field in the salt marsh trying them out. I went out with him last night, but the tiny little gnats finally drove us out. Today he is on his own. I am rather freaked out by a blog entry that I wrote about New Orleans in September of 2004 entitled "Good Luck New Orleans". If you want to look it up, it is there, and it pretty much says that we were concerned about Ivan hitting New Orleans on September 15th of last year, and much of what we are talking about in hindsite now, we were afraid was going to happen then. It is eerie to see what I wrote. Now, the bomb has dropped, there is nothing we can do but pray for the survivors and work hard to make life better for them one person at a time. Homelessness is not an easy issue to solve. I am praying for better days ahead. One hot day last Spring in Oklahoma, my 95-year-old mother and I went to a big Lowe's in Yukon, Oklahoma to look for plants for my mother's garden. Helping her out of the car, and finding a shopping cart that she could use as a rolling "walker", we ambled around the rows and rows of flowers. In this world, most of us have become used to not finding sales people to help. We are used to that, but my mom still thinks that sales people are readily available, and most of all, knowledgable about what is for sale. We were outside in the sunshine, where there were 40 aisles of plants, and, gazing longingly at this vast array of plants and shrubs, my mom said to me, "I'd like you to ask if they have any Mexican Heather." This is one of those little things--her sweet voice asking me to look for something--that I will remember for the rest of my life. 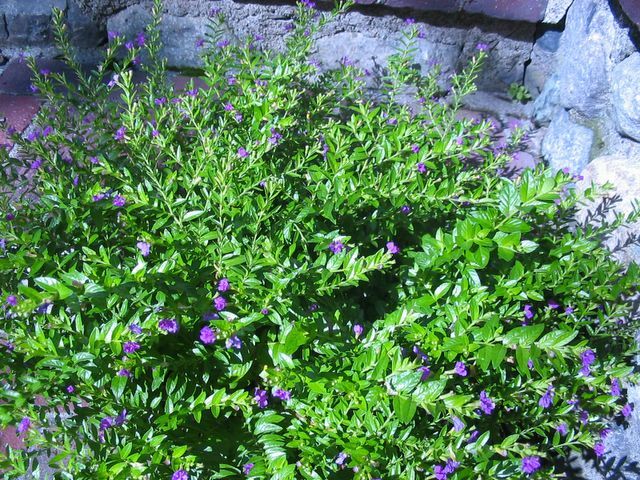 "Mexican Heather? ", I thought to myself, "are you kidding??" I left her teetering on the edge of disaster, clutching on to her shopping cart, while I walked the rows and rows of plants and tried to either find a Mexican Heather display or a sales person. Finally, I asked a clerk at the check out counter inside, who looked at me like I was nuts. Another clerk overheard my request and said, "I think we're all out of Mexican heather." On the way home, we stopped at two other nurserys looking for Mexican Heather for my mom. By this time, she was too pooped to get out of the car, so I just ran in on my mission for heather. No one had any Mexican heather. At the last place I went in, I bought a lovely large hanging basket of assorted flowers for her back door, hoping this would ease her disappointment. Back here in Boston, months later, George and I were walking through a Home Depot, and there hanging up in pots, marked down to $6.99 each, were big beautiful Mexican Heather plants. He loved them, I loved them, and we bought three, which we have been enjoying for a month now. They are hardy, green, and we have to laugh that, of course once again, Mother knows best. Here is a picture of our Mexican Heather. Have a great day. 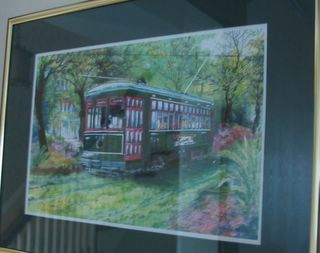 A souvenir of New Orleans: a print of the St. Charles streetcar that hangs in our livingroom. Over the past year and a half, when writing this blog, I have always tried to keep it optimistic and fun. Today is a hard day in America, with so many people hurting and dying in the Gulf Coast. George and I are staying home for the Labor Day weekend, and it just seems like a very very sad time. We are looking for outlets for our energy that are useful and uplifting. I am doing a lot of praying. Today I am concentrating on making jewelry for the art show in two weeks and we are making a trip to the bead store this morning. I shed a few tears this morning, but they didn't help. I've sent money, but it is a drop in the bucket. This is the disaster of the century for the US and it is going to take years of working together to make this better for all these homeless people. I'm sure the people of Houston are scared too, and wondering what they will do with 75,000 homeless people, or more. Other people in American cities are also going to face this onslaught of folks who need everything. This is not a problem that is going to be solved easily. We are going to find out what we are made of. Today my heart is with the people in New Orleans and I hope they get them out soon. It seems impossible to me that we can't just drop National Guard troops and medics with food and water into the convention center and take care of all those people. I'm sure there are emergencies all over the gulf coast that we are not hearing anything about. I have had to turn the television off this morning because the news is so upsetting that it is demoralizing. We need to take care of the healthy ones so we can take care of the sick ones. It is called "taking care of the caregivers". We are all going to be caregivers now. We will keep praying for some light at the end of this long dark tunnel. I look at my New Orleans things in the house and I just want to cry. I'm sure millions of people feel the same way I do. Let's mobilize and do something to help all these people when they get to the next phase of their lives. God is good, New Orleans will be back, and somehow we will get through this. On Saturday, September 10th I am going to have a table at an art fair near Boston. i have been making earrings to sell and will also sell crocheted wire necklaces. George is helping me by shopping for a table and I bought a new purple tablecloth that I think will look nice with the sparkly jewelry. Display is half the reason why people will come look at my jewelry, and I'm busy thinking about how to set up different heights of levels of necklaces and earrings and other ways to make the display interesting and pretty. Last night I took a flyer about the art fair off my kitchen bulletin board and panicked completely. It read that the fair was August 27, and I thought I had missed it. I called Michael for support, since I felt like such an idiot. I was wondering what on earth I was going to do with all this jewelry I had been making. But...lo...I called my Sparks craft studio friend, and she said that the date was Sept.10, and that the flyer I had pinned to the wall months ago was a date that had been changed. Whew. I thought I was losing it for sure. Making beaded earrings seems to be keeping me going right now. I'm so concerned and sad about the state of affairs on the Gulf Coast that it is good to have something else to think about and work on. After September 11th, there was a psychologist on television who said that we all must try to limit some of our exposure to all the bad news, that we can't watch it 24/7 and still keep our own psychological well being. So, even though we are very worried about others, we need to keep a balance and try to stay healthy ourselves. So I will make jewelry, and keep praying.